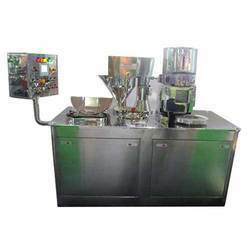 We are a leading Manufacturer of liquid oral manufacturing plant, semi automatic capsule filling machine, hand operated capsule filling machine, automatic capsule filling machine, automatic capsule loader and vibro sifter from Mumbai, India. The complete plant consists of sugar melting vessel, main syrup manufacturing vessel & storage vessel and allied equipment like filter press and pumps. It is offered with bottom entry stirrer or top entry stirrer depending on the customer’s requirement. Externally placed inline homogenizer ensures the entire material homogenization and gives option for desired multiple passes in recirculation mode with self-inbuilt pumping facility within the unit. 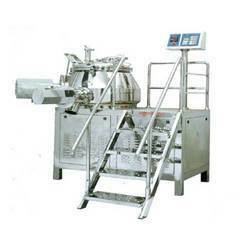 Anvay Pharma Systems has all variety of Semi-Automatic Capsule Filling machines. It is designed to cater the needs of the customer. First model is called single loader station & other model is called double loader model. Double loading station ensures constant supply of loading rings to the filling station of the machine & better productivity of the machine & operator. 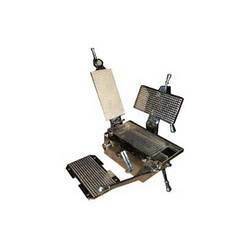 It is designed with minimum moving parts ensuring the minimal maintenance and need of spares. Many options are available on PLC to set various speeds of the machine to achieve the desired weights and the accuracy of filling. Further accuracy of fill weight can be achieved by various types of augers available. It can also be given attachments for pellet & tablet filling. A special design for easy changeover of different capsule size. Automatic deciutching of loader to minimize operator's attention and ensures optimum production. Variable filling table speed for dosage accuracy. Automatic drug hopper in-feed mechanism to eliminate variations. Choice of 4 auger speeds to handle variety of powders from hygroscopic to free flowing. Automatic capsule closing system ensures faster and safer closing and ejection of filled capsules. CE certification will be provided on request. 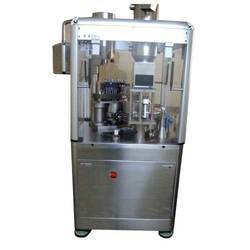 Anvay Pharma systems provide easy and low cost solution for capsule filling in terms of Hand Operated Capsule Filling Machine. Ideal set of machines to make a beginning of capsule filling operations.It provides also flexibility in filling small batches of powders. Pellets & tablet filling attachments options are also available. Anvay Pharma Systems has all the range of fully automatic capsule filling machines suitable for R & D as well as for mass scale productions. All fully automatic capsule filling machines are based on five stage tamping principle where the powder dosage is formed in five stages which is hard enough for filling but soft enough for dissolution. The overall design provides the smooth rotations of moving parts having no vibrations. A well designed auger feeding ensures a good cake formation in the filling tub; ensuring better slug formation & accuracy of fill weights. It also offers options for Tablet Filling, Pellet filling in combination with powders. We are offering Automatic Capsule Loader to our client. Vibro Separators are circular unitary gyratory screens used to separate mass composition of solids from solids, and for gradation of materials as per particle size, having a very wide range application. The Multi Mill is used for granulating, pulverising, shredding and chopping of materials. Odd-size crystalline material / granules can be reduced to the required size by fitting interchangeable perforated screens around the swing hammer blades. 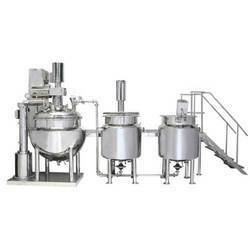 Anvay Pharma Manufactures Starch Paste Kettle designed for application in pharmaceutical processing units and mainly used For Preparation of Starch Paste. In RMG Mixing and wet granulation process is performed in one sequence. The fast moving mixer blades having special angles enforce the powder material into spiral fluidization at the bowl base. The vortex in the material provides faster and uniform distribution of the ingredients. 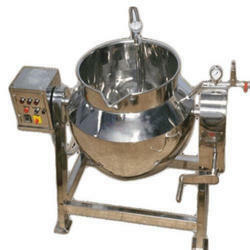 The shape of the bowl is designed to ensure constant flow of the processing material. By adding binder through charging hole, particles are constantly moistened and bound to larger granules. The specially designed chopper blades shears the circulating powder and break down lumps. Thus granules attain higher density and uniform particle size. The product is discharged through the discharge port quickly due to gravity and aided by slow rotation of the mixing blades. It comes with safety features such as safety grills to charging port, interlocking of motors with its covers, and further interlocked with air pressure. These RMG are available in many sizes as per the customer’s requirement. 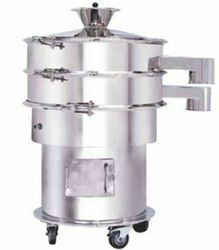 Anvay Pharma manufactures Communiting Mill which is used for Dry and Wet Milling/Size reduction of wide range of products. It’s suitable for standalone as well as online milling. Ointment manufacturing plant finds its application in the various fields viz. in Pharma field for creams, gels, sterile and non- sterile & biotech products too and in Cosmetic field for cold creams, hair dye creams, conditioners, lotions gels, shampoo & tooth paste etc. This manufacturing has three main sections viz Main Vessel, wax vessel & water vessel. 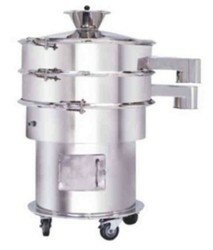 APS’ OINTMENT PLANT comes with many features such as Semi Contra Type Anchor with fix anchor; Small Anchor with gear motor for wax phase vessel; All Pipeline are electro polished from inside, Bottom entry specially designed Homogenizer provided with double mechanical seal ,with cooling system & safety switch operated by control panel choices for anchor design . Lifting Mechanism consists of Hydraulic Cylinder driven by power pack complete with solenoid valves housed in a MS column with guide bush. Cylinder operating MS Ram, in turn fixed on the top dish of the mixer for rising / lowering of the drive head by suitable height rising / lowering motion controlled through push buttons housed on panel itself. The entire lifting assembly suitably cladded with SS Covers. Also it provides flexibility for Homogeniser mounting either from side or top entry. The medium is made to enter at bottom and is provided with circulation facility. The top is designed with torrispherical shaped design and bottom section has hemispherical shape. 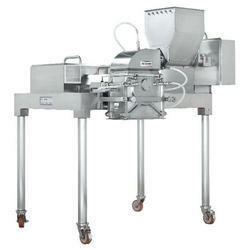 For effective cleaning the top lid is provided with hydraulic lift. VFD is also provided for achieving various rpm for anchor agitators and homogeniser. VFD for Anchor agitators to vary the RPM. The basic application of this equipment is to segregate the particles from one another as desired. Required size sieves can be fitted on the machine and the desired particle size material can be obtained. To obtain the different sized material from the same batch of product; there is possibility of multi deck facility where different graded sieves for desired particle size can be fitted on one another. Normally double deck, triple deck vibro sifters are commonly used. Vibro sifters are fitted with motor, unbalanced weight, springs on a rigid frame; so that required vibrations in tangential & vertical manner can be obtained; which further helps in segregation. The complete plant consists of sugar melting vessel, main syrup manufacturing vessel & storage vessel and allied equipment like filter press and pumps. It is offered with bottom entry stirrer or top entry stirrer depending on the customer’s requirement. Externally placed inline homogenizer ensures the entire material homogenization and gives option for desired multiple passes in recirculation mode with self-inbuilt pumping facility within the unit. The vessels are designed in torrispherical shape. Many controls can be mounted and programming through PLC can be offered to ensure the repeatability of process and retrieval of information. 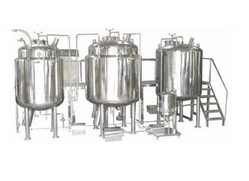 It is complete cGMP system and normally built in SS316 & 304. · The gaskets used are of silicon (food grade). · All contact parts are of S.S. 304 quality material (SS316 provided on demand) & finished to class 4B (Mirror) finish and are crevice free.